Judge Sonia Sotomayor's nomination to the U.S. Supreme Court is a historic milestone for Latinos, but it resonates well beyond Hispanic pride. It is perhaps the most potent symbol yet of a 21st century rapprochement between the U.S.'s two largest minorities, Latino Americans and African Americans, who in the 20th century could be as violently distrustful of each other as blacks and whites were. And it's bad news for an already beleaguered Republican Party. Just five years ago, the GOP thought it had begun a conquest of the Hispanic vote, but it saw its share of that electorate plunge 13 points in last year's presidential election, when Obama persuaded Hispanics that they could trust a liberal black candidate to champion their interests after all. As Amandi notes, one election and one high-court pick won't have blacks and Hispanics sharing rap and salsa around a campfire. Immigration, for example, isn't a priority issue for African Americans  most Latinos feel Obama needs to ratchet up his commitment to it  and Latinos aren't as passionate about affirmative action. But it is indeed hard to overstate what a sea change their apparent alliance represents. As the U.S. Latino population began to mushroom in the 1980s and minority competition for employment and resources became more acute, the black-brown divide turned into a chasm. Many blacks viewed Latinos as interlopers getting a free ride on the civil-rights trail African-Americans had blazed; Latinos resented the notion that they were merely junior partners in minority politics, that their own demands for good jobs, schools and neighborhoods were somehow considered gate-crashing. By the '90s, the frustrations turned violent. In 1991 blacks rioted for days in Cuban-dominated Miami after the conviction of a Hispanic police officer for killing two African Americans was overturned. That same year, Hispanics in black-controlled Washington, D.C., did the same after a Latino was wounded by a black cop. Through it all, blacks tended to retain their political leverage because Hispanic voter turnout was abysmal by comparison. That began to change at the turn of this century, when Latinos not only overtook African Americans as the largest U.S. minority (now about 15% of the U.S. population) but also started building ballot-box muscle. By 2004 they seemed to be splitting with the Democratic Party as well, giving George W. Bush a surprising 44% of their vote in that year's presidential election. But the GOP, owing to its rabid anti-immigration current and the failing economy, alienated those Latino voters almost as quickly as it had gained them. That allowed Obama's 2008 campaign to build common ground with Hispanics on issues like health care; in the end, he even took the Latino vote in Florida, a once reliable Republican bloc. Race-relations experts, meanwhile, did double takes. As recently as 2007, a poll conducted by Bendixen and the California-based New America Media organization had found that a majority of Hispanics and blacks preferred to do business with whites than with each other. But in a Gallup survey last year, about two-thirds of each group suddenly said they thought their relations were good. "From a Hispanic perspective, Obama's election didn't just mean that a black man could be President, but that any minority person could," says Freddy Balsera, a Miami-based consultant who headed the Obama campaign's Hispanic- communications effort and is now a chair of the Democratic Party's National Hispanic Leadership Council. "As a result, on Election Day you could feel a new appreciation on both sides for each community's struggles." Much of the change is generational  an acknowledgment by younger blacks and Hispanics that their parents' adversarial relationship makes less sense in the more genuinely multiracial society the U.S. has become. "You look at President Obama and Judge Sotomayor, and you don't just see a black and a Hispanic but also Columbia and Harvard and Princeton and Yale," says Morial, who attended Tuesday's White House ceremony announcing Sotomayor's selection, referring to the universities Obama and Sotomayor attended. "You see two beneficiaries of civil rights representing a new generation that no longer sees their two communities as competing with each other. The mindset that existed before is dying out." For one thing, Morial says, the two sides have begun to learn much more about each other, thanks in part to joint political lobbying work in recent years between groups like the Urban League and La Raza, a major Latino advocacy organization in Washington. Black leaders now realize that they can't expect a group like Latinos, with such diverse national origins, to be as politically monolithic as blacks have historically been. Latino leaders, in turn, are less prone to underestimate (as leaders in South American and Caribbean countries too often do) the social disadvantages of being black in America. 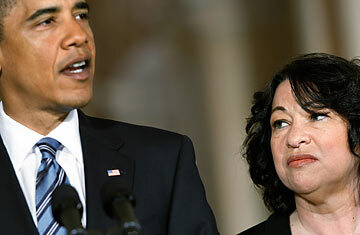 At the White House, Sotomayor remarked that she has "stood on the shoulders of countless people." The truth is that some of those shoulders belonged to African Americans who marched and died during the civil-rights era so minorities could someday become Supreme Court Justices. But if it's fitting that more Latinos today recognize the debt they owe the past, it's just as appropriate that blacks are more seriously acknowledging "how important Latinos are to the future of the country," says Amandi. Or, as Obama may well have been saying when he nominated Sotomayor this week, how important they already are to its present.